Watermelons have been extolled by nutritional and health experts alike as the big thing in highly nutritious and beneficial fruits. Watermelons are popular because of its enticing colour, sweet and refreshing taste, as well as its delicate yet crunchy texture. This fruit is versatile because it can not only be eaten by itself, but also be blended into a refreshing smoothie, and can be combined to crisp salad greens to make up a summer salad. But what makes this fruit even more valuable is that regular consumption of this fruit can aid in weight loss as well as prevent ailments. Just like apples, watermelons are rich with dietary fiber that can help us with having better digestion. Because of this, watermelons are great substitute for high caloric food when going on a diet or trying to lose weight because the dietary fiber helps us feel full or satiated for a longer period of time. A watermelon is made up of 92% of water which makes it great for hydrating the body. This in turn prevents dehydration and those who are trying to lose weight can also benefit from it because the water in the watermelon can make one feel full easily. Watermelons do not only provide hydration but they also provide energy because of the variety of vitamins that they offer. These vitamins range from vitamin B1, B2, B5, B6, to B9. All these are essential in cell metabolism. This great fruit is loaded with essential minerals that promote good health. These are magnesium, calcium, potassium, and iron. Magnesium is one of the master mineral that watermelon contains because it is involved with over three hundred cellular metabolic functions. Together with calcium, they support good bone health and a stronger body. Watermelons are also proven in stabilizing blood pressure and this because of the amino acids that are in this fruit. Its amino acid citrulline produces another amino acid arginine which is responsible for the process of removing ammonia from the body. In turn, it produces nitric oxide that helps in stabilizing blood pressure and with an added bonus of preventing erectile dysfunction. Watermelons are high in vitamins C, A, lycopene and beta carotene which are antioxidants that help prevent a lot of serious diseases. These antioxidants even help in reducing the risks for acquiring asthma, heart diseases, cancers including prostate cancer, and other serious diseases. Beta carotene also can support healthy eyesight and even plays a good role in preventing glaucoma. The following information here may come as a surprise because it will talk about the lesser obvious parts of the watermelon that most people simply discard when eating this fruit. The seeds of a watermelon can actually be dried up and roasted to make a nutritious and delicious snack. These seeds are very high in fiber, amino acids that include arginine, protein, vitamins and minerals. They can also be turned into tea which is great for curing kidney stones. The rind of a watermelon deems to be highly beneficial as well. In fact, a lot of experts agree that the rind is more nutritious and beneficial than the center part of the fruit. It is rich with amino acids, vitamins and minerals. Apart from being richly packed with mineral, nutrients, vitamins, and anti oxidants, watermelons are also known for providing natural enhancements to the skin and hair. 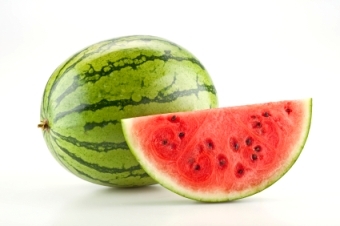 The oil obtained from watermelon seeds is rich in unsaturated fatty acids such as linoleic and oleic acids. This kind of oil is penetrates deep into the skin and can provide nourishment to make the skin appear healthier and more supple. It also helps in the removal of excessive sebum from the skin which makes it a very potent cleansing agent. The good thing about watermelon oil is that it does not clog the skin nor does it give allergic reactions to it. Because of its emollient properties, this oil can be often found in skin cosmetics such as baby oil, facial creams, lotions, eye creams and even soaps. Aside from the skin, watermelon oil is also great for the treatment of dry and itchy scalp. And because this type of oil is highly nourishing, it helps in taking away the frizz in the hair, leaving you smooth, shiny and soft hair. Opt for the dull-looking kind because the shiny ones indicate under ripeness. Find the spot in the melon where it has been resting itself on the ground. Choose the one that has a yellowish color. If this color is lighter, then this means that it is not ripe yet. Try to knock on the melon; keep in mind that you are looking for a crisp sound and not a dull one. Pick them up and try to weigh them. It should be heavier than its size. This means that the inside of the fruit is filled with water. Lastly, make sure that the melon looks like a superstar. This means it should be concisely round and does not have any bumps, bruises, dents or cuts.